United States Ambassador to the U.N. Susan Rice spoke with CNN anchor Wolf Blitzer about Gadhafi’s violation of the U.N. Resolution. This interview aired today during The Situation Room with Wolf Blitzer from 5 p.m. to 7 p.m. ET on CNN. A full transcript is after the jump. 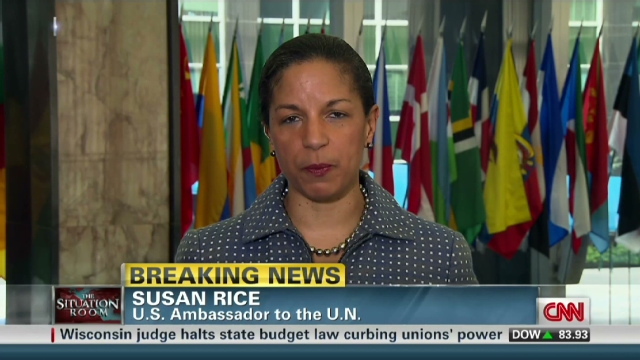 WOLF BLITZER, HOST: And joining us now, the United States ambassador to the United Nations, Susan Rice. Ambassador, thanks very much for coming in. Let’s go through some of the points. Gadhafi right now, is he in violation of U.N. Security Council Resolution 1973? SUSAN RICE, U.S. AMBASSADOR TO U.N.: Yes, he is. Resolution 1973 demanded an immediate cease-fire and an end to all offensive operations. It also banned any air flights on the territory of Libya. The president just recently issued an ultimatum, this afternoon, with immediate effect, which said that Gadhafi had to cease fire, stop moving on Benghazi, protect civilians, pull back from three key cities that he has been attacking, allow electricity, water and gas to flow to all civilians and allow humanitarian assistance in. And if Gadhafi doesn’t do so with immediate effect, he will face the consequences, and the president was very clear that those consequences will be military. BLITZER: How much time does Gadhafi have? RICE: The cease-fire must be implemented immediately. BLITZER: Well, does that mean that if — if by tomorrow, he hasn’t done these four things that the president laid out, the U.S. will act? RICE: Wolf, the U.S. is ready to act, along with partners from the League of Arab States and Europe. Gadhafi should be under no illusions that if he doesn’t act immediately, he will face swift — swift and sure consequences, including military action. BLITZER: Well, it’s now 24 hours since the U.N. Security Council passed the resolution. People are dying right now. He’s still killing people based on all of our eyewitness reporting. What’s the delay? Why not act? RICE: Wolf, I’m not going to get into the operational plan here on television. But I can assure you that the United States and partners in Europe and, in particular, partners from the Arab world are planning and preparing and have positioned assets that are ready to act if Gadhafi does not implement the terms of this ultimatum immediately. BLITZER: Because a lot of people are — the rebels, the opposition, they’re telling our own Arwa Damon, they’re telling our reporters on the scene and they’re appealing to the world, please help right away. If you wait another 24 hours, another 48 hours, a lot of people are going to die. You appreciate the urgency of what’s going on right now? RICE: We very much appreciate the urgency, which is why the Security Council acted with unprecedented speed after the Arab League issued its appeal. What we passed yesterday, Wolf, was a resolution with sweeping implications authorizing the use of force to protect civilians, to impose a no-fly zone and a series of sanctions that, frankly, I think will be quite severe. They include military authorization to enforce the arms embargo; a ban on any flights in and out of Libyan territory, particularly those that are, we believe, bringing in mercenaries; an asset freeze on all of Libya’s principal companies, including its sovereign wealth funds and its central bank. So these are very serious steps and they reflect the urgency that we and others in the international community see as — as being necessary. BLITZER: And you’re — are you still demanding that Gadhafi must go? RICE: The president has been very clear that he has lost his legitimacy to rule, if he ever had any, and he ought to go. BLITZER: If he — if he does — doesn’t go or if he fights and the U.S. or its allies capture him, will he be subject to war crimes? RICE: Well, there is — the first thing the Security Council did some three weeks ago, Wolf, was to refer the situation in Libya to the International Criminal Court. And you heard the president reaffirm today that Gadhafi and those around him will be held accountable for war crimes and crimes against humanity. BLITZER: Does the resolution authorize military action directly aimed against Gadhafi personally? RICE: No, Wolf. The purpose of the resolution is to protect civilians and to ensure that — that Gadhafi and his forces are not able to continue to go after innocents. That’s the purpose and that’s what we will be doing. BLITZER: So if he complies with this resolution, windows his forces and does all the other things that they demand, will you allow him to stay in power? RICE: Wolf, I’m not going to get into — to next steps. The purpose of this resolution and the enforcement action that the president affirmed our readiness to undertake had a very clear purpose, and that purpose was to protect civilians, to hold Gadhafi accountable and — and to increase the pressure on his regime. We have a range of measures separate and apart from what is contained in the Security Council resolution at our disposal to implement other aspects of U.S. policy, but I’m describing precisely what the resolution allows. BLITZER: Does the resolution authorize arming the rebels? RICE: The resolution doesn’t specify that, but — and it — and it doesn’t authorize it, but I don’t — I think a careful legal reading of it would suggest that it doesn’t preclude it either. RICE: Wolf, I’m not going to get into all aspects of what may be U.S. policy, but I will say that we are focused immediately on protection of civilians, on ensuring that the march to Benghazi does not continue and that those who are most vulnerable have the rights and protections that they deserve. BLITZER: Which Arab air forces will participate in the no-fly zone? RICE: I will let those governments speak for themselves. We have heard indications already from countries like the United Arab Emirates and Qatar that they are interested in participating. They can make their announcements as and if they’re ready. We look forward to participation from a number of important Arab partners, as well as Europeans and others. BLITZER: One final question, because I get — I’ve been asked on — on Twitter this by a whole bunch of followers out there, people who are following me. Who’s going to pay for all of this? RICE: Wolf, this is a coalition effort, and it will involve the contributions of Arab countries, of Europeans and — and others; Canada has also agreed to participate. This is not the United States alone or even predominantly. We will be part of this coalition, and the costs and responsibilities will be shared broadly. BLITZER: If you have questions for Ambassador Rice, you can Tweet her your questions @AmbassadorRice — all one word. Ambassador, thanks very much. Good luck.